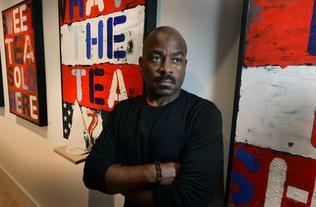 A multi-media installation artist and storyteller, Willie Little was born and raised in rural North Carolina. Understandably, many of his works are rooted in the Southern traditions of his upbringing. He has vivid memories of the characters and scenes at his father’s illegal liquor house that functioned “during the day” as a grocery store. In an incredibly lucid manner, he has translated this living texture in both figurative and abstract ways, “see[ing] beauty in history and decay.” His work also centers on hope, restoration, discovery, and triumph. Willie’s oxidation paintings utilize acid and iron particles to achieve a look of aged metal, possessing an organic feel in their expression of time. The layered and eroded material is subject to the artist’s environmental manipulations (exposure to heat, light, and air) creating permanent, brilliant, sometime iridescent, surfaces. Willie received his Bachelor of Arts degree from the University of North Carolina at Chapel Hill. He has been featured on National Public Radio and numerous television programs and work has been exhibited at the Smithsonian Institution in Washington, D.C. and in many other cities including Philadelphia, Detroit, Dallas, Kansas City, Atlanta, Charlotte, and Santa Fe to name a few.